Lanolin Hydrous GRX® is a powerful topical lubricant that helps to treat, protect and soften very dry, rough or chapped skin. This deep moisturizing ointment contains just purified water and Lanolin USP (a natural skin conditioning agent). 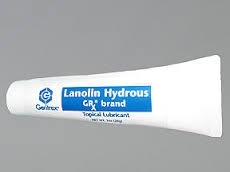 Lanolin Hydrous GRX® is very effective in relieving dry hands, diaper rash, burns and other minor skin irritations. Lanolin Hydrous GRX® is also bacteriostatic and fragrance-free, making it perfect for everyday use. Apply a small amount of lanolin topical to the affected area and rub in gently.